Salamz Parvez, Sorry for contacting like this but I just want to tell you that I saw your film at a friends place in Riyadh…and there was 6 of us…it saved my life, Parvez…I grew up in KSA and the film gave me the courage to try and leave and be who I want to become…may Allah swt bless you, Parvez bcoz there r so many people like me who need to know just that they r not alone…Inshalllah we will one day meet…My name is Muhammad btw, but u can call me Mo. People often ask me how I measure social change. I have tried to measure it by emails like the one I have cut and paste above which I received from a young man in Saudi Arabia, not too long ago. I have measured it by the immigration officials from the USCIS at the Department of Homeland Security who after watching the film and hearing me speak came up to me and said that they would never look at asylum applications from gay Muslims with the same kind of prejudice ever again. I try and measure it, one person at a time. Therefore, it is a pleasure and an honor to be able to tell you about the remarkable journey of this work which continues to create meaningful and measurable social change within many communities worldwide. After its premieres at the prestigious Toronto International Film Festival (2007) and the Berlin International Film Festival (2008) (Opening film of the highly competitive Panorama Documentary Section), “A Jihad for Love” traveled to film festivals in more than 50 different nations. I was able to travel to 22 of them, turning cinema halls into town halls, where audiences participated in vibrant discussions of the nature of faith, the critical need to look at Islam beyond a narrow framework of “Jihad” as violent warfare, and the ability of believers to create substantial dialogue and change within communities of faith. The film was theatrically released widely in the US and Canada and had a month long run at New York’s IFC theater. Every single workshop, debate or question and answer session I conducted after these countless screenings opened up unprecedented debates about 21st century Islam, about the film’s giving agency to Islam’s unlikeliest storytellers (LGBT Muslims), about the challenges of trying to find safe and equal theological spaces within the many orthodoxies of Islam and about educating non-Muslim audiences about a vibrant, peaceful and non-violent Islam in a post 9-11 media and political landscape where these perspectives on this faith have rarely been available. Together, we confronted spiritual violence and its enormous consequences head-on. Together we continue to save lives. As a Muslim filming in more than 12 nations, usually in secret and without any government permission, I had put my life and indeed the lives of the remarkable Muslims depicted in the film in considerable risk. The fact that “A Jihad for Love” spoke with a unique and respectful Muslim voice, as well as the unprecedented worldwide publicity that stressed the film was not an attack on Islam, ensured that the film was mostly embraced within Muslim communities. The few times it wasn’t, the dissent did not lead to widespread, violent and angry protest. Most critically this work and its continued exposure around the world have saved hundreds, perhaps more lives. Scores of gay Muslims continue to email me saying that, for the first time, this work taught them that they were not alone and that perhaps there is hope and possible redemption in knowing that God, Allah created them as much as he created all of humanity. So many milestones have marked this incredible journey. I was able to travel to Beirut, with producer Sandi DuBowski to present the film publicly for the first time in any Arab country. The two packed screenings turned into town-hall-style workshops, which gave us the rare opportunity to engage with the very people the film was made for. The film toured in eight cities in the world’s largest Muslim nation, Indonesia, which provoked a remarkable response. In Istanbul, despite a hostile reaction from the religious press, I was able to stand and defend the film with Mazen, the young Egyptian once jailed and tortured by Hosni Mubarak’s police state, and with the remarkable openly lesbian couple, Ferda and Kiymet, also profiled in the film. A packed screening and debate was organized in a screening space in Karachi, Pakistan. There had been private screenings in the country before, however this event was open to the public. In Kuala Lumpur, several public screenings included people like the former Prime Minister Mahathir Muhammad’s daughter, who wept publicly after watching the film. Members of Nazra, a feminist organization in Egypt, organized a public screening and debate in post-revolution Cairo. NDTV, one of South Asia’s largest broadcasters with enormous viewership and a footprint across the entire Indian sub-continent, the entire Middle East, North Africa and much of Europe broadcast the film to an audience of millions in 2009. Death threats followed after Channel 4 in the UK broadcast the film. Millions in Europe watched the film when it was repeatedly telecast on the continents biggest broadcasters, Arte and ZDF. A very large number of LGBT audiences in the US were reached by our very successful broadcasts on MTV’s Logo network. “A Jihad for Love” became one of the most popular products in its category on Netflix and Amazon and by sub-titling the DVD in eight “Muslim” languages we have ensured the longevity and broad reach of this film. Emails, tweets and facebook messages continue to inform me about scores of private screenings in Tehran, Jeddah, Kuwait, Lahore, Damascus, Amman, Dhaka, Marrakesh, Dakar and even Addis Ababa. This work has penetrated Muslim communities worldwide and continues to be incredibly relevant across the world. The screenings have never stopped. 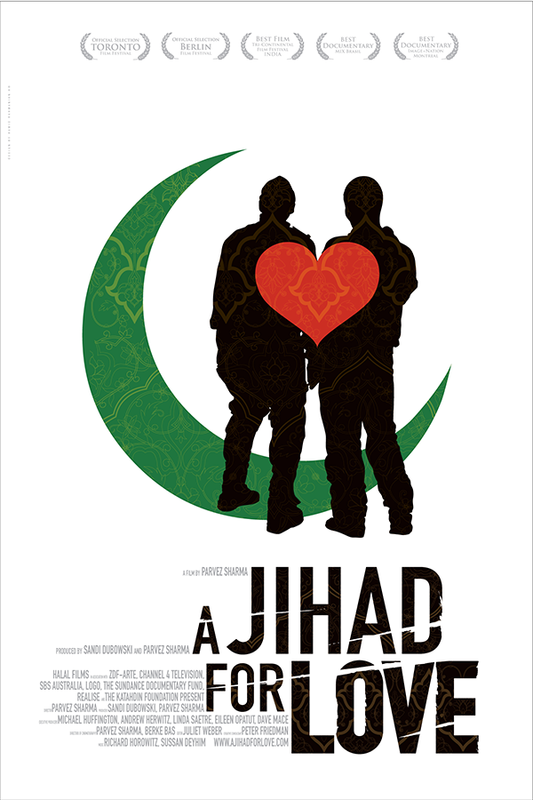 It is important to mention that based on television ratings in the Indian sub-continent/Mid-east/Europe and North America, theatrical release figures in the US (30 cities) and Canada, hundreds of University and institutional screenings we estimate that approximately 8 million people in more than 51 nations have seen “A Jihad for Love”. The film is also being used to teach various Islam, Sexuality or Human Rights/Immigration syllabi at a wide range of prestigious college campuses across North America, Europe and the Indian sub-continent. The impact of this work has been felt at the highest levels of government. Using clips from the film, I headlined an all day event at the US State Department as a keynote speaker. I was invited by the European Union, parliamentarians in the Netherlands and in Germany to conduct workshops and talks using the film and my work and experience in the Middle East, North Africa and the Indian sub-continent. The all-day event and workshop I conducted at the US Department of Homeland Security in late 2012, that transformed so many within the highest levels of US government policy making, was a remarkable milestone in our journey to change hearts and minds. In 2009 I took my voice and my critique of painting the so-called “Muslim World” in broad brush-strokes to the United Nations in Geneva as a keynote speaker at the Durban Review Conference. The same year I was keynote speaker at the “Gay Games” in Copenhagen, addressing the complex issues of Islam and homosexuality to one of the largest international gatherings of LGBT activists from across the world. The same year we worked with German Parliamentarians and notably the head of the Green Party in that country designing and conducting workshops related to assimilation issues in Western Europe. A multi-city tour in the Netherlands that I designed with Amnesty International helped me in organizing local communities grappling with what the press in that country had labeled the fears of “Eurabia”—with me publicly and successfully challenging the Islamophobia of the extreme right in that country just as Geert Wilders was releasing his deliberate slandering of Islam—his controversial “film” called “Fitna”. In the last few years I have harnessed the participatory power of the social web to expand the reach of this work. I already have a very attractive “brand” and a dedicated audience of thousands who are already invested in my work. With several thousand followers/friends on Facebook and Twitter and using my own social media and multi-platform dynamic distribution skills, I continue to ensure that this work will always create enormous impact and debate. Also as part of my continuing work as an Adjunct Professor at New York’s Pace University I teach a full semester course called “Convergent Media”. As an educator talking about and working with the fast paced new-media landscape, I have been able to create a cutting edge and highly innovative curriculum that critiques and aims to understand the possible (and sometimes imagined) impact of social media in some of the most dangerous regions in the world with a special emphasis on the Middle East (especially Egypt), Iran and Pakistan. The social web success of the film has been a key teaching component. After reporting live from the Egyptian Revolution via twitter and Facebook and a large amount of blogging I have been noticed (and both applauded and critiqued) widely in the social media universe. In 2011, Google invited me to talk about and workshop my strategies of social media focused news reportage of the ongoing events known as the “Arab Spring” at their New York headquarters. I have continued to share my skill-set at college campuses across the US and at Social Media conferences and seminars. The communities of contacts built with A Jihad for Love have always been key to this new and expanding work. The examples above are just a small sampling of the continuing worldwide impact of this film’s work and my continual efforts to be an agent of change within the ongoing Islamic Reformation of the 21st century. Our work however is far from finished. Muslims like myself and the remarkable individuals who share their lives in the film need our seat at the table; I have always believed that true reform, within religious communities, can only be created from within these communities. It is the believers of a faith who have the potential to be heard best within their faith. I also know that some of our last and most bitter battles in this still new century will be fought on the frontlines of religion. im Mustafa Saeed, 23 years old Film maker & Graphic designer from Somaliland. And in the early days, this email from Yousuf (not his real name) broke our hearts. He was finally able to watch the film. It saved his life and allowed him to break free. It is reproduced exactly as we received it. I am writing to you with no prior contact because you are my last destination of hope. The moral dilemma that you convey in your new documentary is eating my from within. I am 17 years old and the youngest of five children, of whom two are mentally disabled. My parents are very religious, and after having lived 17 years in France, they have still not integrated themselves, due to lack of language and difference of religion and culture. I simply need your help because I am alone in the struggle against my parents. I do not know whether they have the upper hand because they know the truth about whether homosexuality is a major sin, but what I do know is that they use it against me all the time. Personally, I am very much certain that I have not consciously made the decision to be a homosexual. I think all my misfortune began when I was raped at the age of six by a teenage friend to the family. I suffered many years of guilt and lonelines, and on top of that, today I am gay. Coming from my family and having my background that is the worst a person can be. So in Nov 07 my parents found out about my homosexuality and my third world war started. I was kept isolated during a month, very much confined to my home with no means of communication with the outside world whatsoever. I was given the ultimatum to either cure my self right away or be murdered and eliminated by my 30 year old brother/stoned to death by my father. Part of the cure would be going to Mecca with my mother in Dec 07, but I refused due to my school committments. They forbade me from seeing my one and only true friend, because he is a Christian transexual boy, and if I would have seen him without their approval, my brother and his wife would hire someone to eliminate my friend too. So I submitted to the atrocities hoping that I would find my way out of them soon. When school started in Jan 08, the social services were contaced, which further infuriated my family. Since then matters have shrunk almost to natural size and today I am no longer bothered by my brother and his wife thanks to an arrangement by the social services. Please Parvez, I must see your documentary for I can no longer live and love with the knowledge that I am displeasing Allah. Please help me! These people, all around the world, continue to be my measure of success and their being able to watch and share this work, fills me with the deepest humility and a desire to carry on. These examples are just a few, from thousands. The emails, facebook messages and DM’s on twitter continue to pour in, even today. As a Muslim, I therefore intend to continue this work, adding my voice to what I know are many. These people, all around the world, really do continue to be my measure of success and their being able to watch and share the work I have done, fills me with the deepest humility and a desire to carry on. As a Muslim, I therefore intend to continue this work now taking a daring new form with “A Sinner in Mecca”; our unprecedented new work telling the story of Islam like it has never been told before, from its ground zero, the ancient city of Mecca in Saudi Arabia. Finally, we have been honored to have a wide network of support in funding our work over the years, and the partial list below is a testament to the power of its message and its purpose. Rita J. & Stanley H. Kaplan Family Foundation, Inc. Most importantly, this remarkable and continuing journey of creating change and saving countless lives would not have been possible without all of you. And together, we can now join hands to make sure that “A Sinner in Mecca” broadens and continues this journey of creating change. Because, after all, our biggest battles still remain to be fought. And they will be fought on the frontlines of religion.